Manufactured in Japon from 1983 until 0. 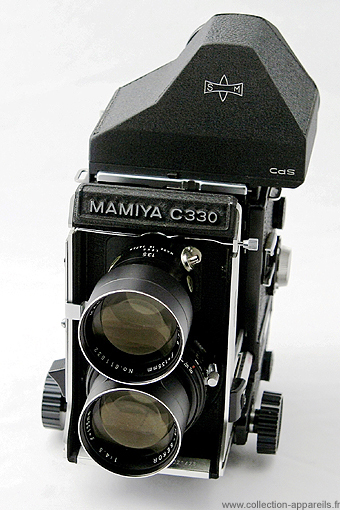 This is an evolution of the Mamiya C33. 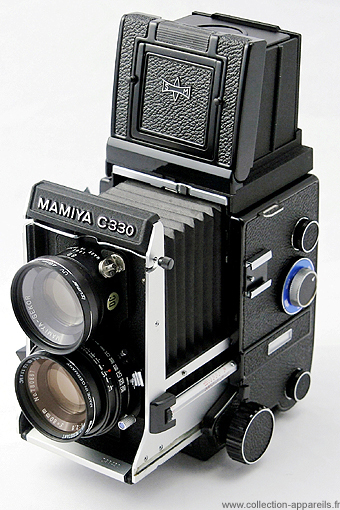 6X6 cm format camera, using 120 or 220 films with interchangeable lenses, rather of professional use and especially dedicated to studio portraits. The originality of the system is that shooting and viewing lens are both installed on the same supporting plate, and it is this plate that is interchangeable. 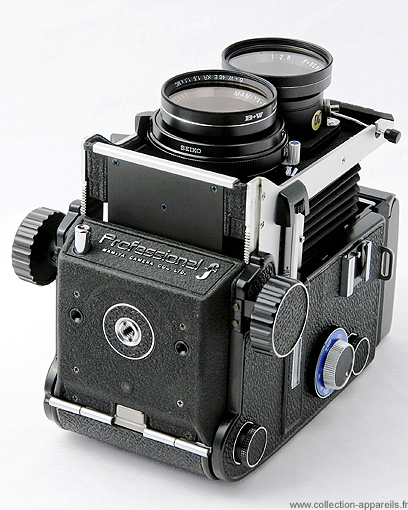 The lens plate is mounted on a sliding support system on a long rail, with two knobs for focusing. Note that there are two bellows, a large bellows protecting both the sighting and shooting chambers, as well as a smaller bellows, itself inside the large one, for the shooting chamber!!!!! Thanks to the locking system of a hatch, this system allows the optics to be changed while preserving from the external light to ingress as much as possible. The ground glasses become interchangeable and a large range of different types is available, chequered, with stigmometer and so on. A large range of viewfinders is completing the standard one. With a prism, with or without CDS cell, with magnifying lens etc.. Some other accessories are released. Handgrip, with or without trigger. System allowing the parallax correction in case of short distance shooting. In addition to the standard trigger button, a second one is made available, located at the base of the camera, adding some comfort of operation. The standard lens is a 80 mm opening at 1: 2.8 and combined with a Seiko shutter from 1 sec to 1 / 500th of a second and bulb exposure. According to the evolutions, the lenses have undergone some changes, in particular regarding the diaphragm, the ring of which becomes notched. The last version is recognizable at the blue dot on the cocking button. 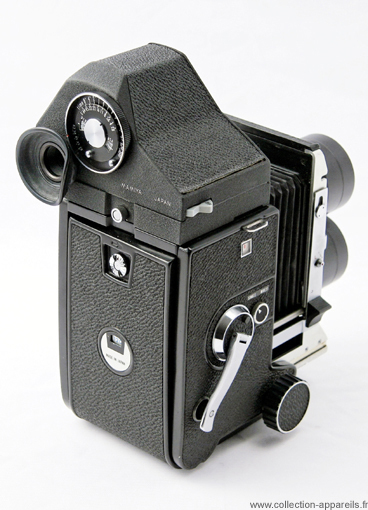 The shutter is automatically cocked at each crank rotation, winding the film to the next image to be taken. The lens range goes from the 55 mm to the 250 mm, including 65, 80, 105, 135, 180 mm. All of these lens are attached to the same Seiko shutter as for the standard 80 mm. The chrome lens are the older and the black finish versions are the latest. This makes its use more attractive in studio.